After two writing posts in a row, it’s time for one on historical research, I think. As I’ve mentioned in a couple of previous posts, I have begun work on The Shattered Drum (Legends 5: Center). Originally the title referred to a shaman’s drum, and the idea was to focus on Grusha, one of the few important lower-class characters in the series. But as tends to happen with my novels, I realized belatedly that since Nasan is the main series character—heroine of books 1 and 3, vital subplot character in book 2, and important viewpoint character in book 4—Legends 5 should round out her journey in an emotionally satisfying way. At more or less the same moment, I recognized that the symbol of the shattered drum has a broader thematic meaning that relates as well to the revised plan as to the original one. So Grusha, like several other “leftover” characters whose full histories never quite fit in to the overarching story, will one day have her own novel in a new series that is banging around in the back of my brain. Meanwhile, the new plan requires additional research, which is where the Lithuanian Renaissance comes into the picture. Now, if you read my posts regularly, I assume you have enough interest in history to know what the Renaissance is—or was. But Lithuania? Seriously? I think most people see the Renaissance as an Italian, or at least West European, phenomenon. Lithuania, in this view, is a teensy Baltic state that escaped Soviet control a bit more than twenty-five years ago. Venice—Renaissance, but Vilnius? But you would be surprised. First off, Lithuania in the sixteenth century was not the least bit teensy. As the Grand Duchy of Lithuania, it included most of modern Belarus and Ukraine. At its height, circa 1430, it encompassed 360,000 square miles. 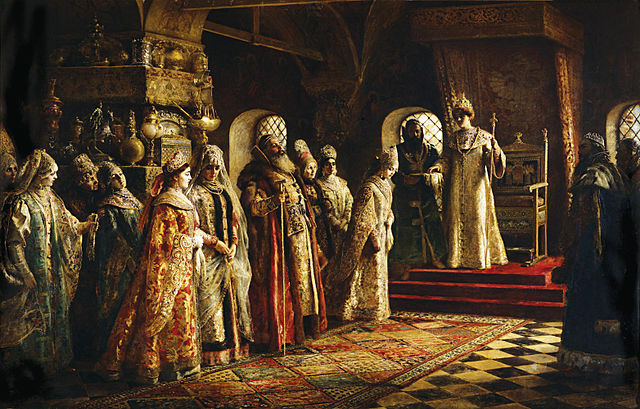 It had a large Eastern Orthodox population, and its state language was Russian. Two and a half million people called Lithuania home in 1430, a level the country would not reach again until 1790. Second, unlike neighboring Russia, neither Poland nor Lithuania was isolated from the Renaissance. They sent students to the universities in Padua and Bologna. They imported art and architects and artisans from the south. They had a thriving commerce with most of the rest of Europe. 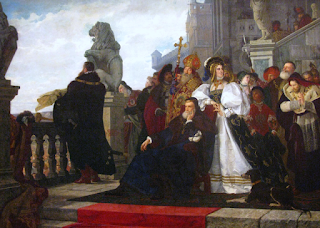 Because of Lithuania’s dynastic ties to nearby Poland, it had a Catholic population as well as an Eastern Orthodox one, and by the 1530s it had become caught up in the Protestant Reformation as well. Third, in 1538, the time period of The Shattered Drum, Poland and Lithuania shared a pair of co-rulers, both confusingly named Sigismund (Zygmunt): Sigismund the Elder and his son, Sigismund Augustus, each of whom served simultaneously as king of Poland and grand duke of Lithuania. Sigismund the Elder was then in his seventies; Sigismund Augustus had yet to turn eighteen. But the crucial detail is that twenty years earlier, in 1518, Sigismund the Elder had married Bona Sforza of Milan and Bari, who became the mother of the younger Sigismund. Bona’s arrival strengthened the Italian contingent enough to turn Krakow and Vilnius into mini-versions of Florence. You can see the difference right away in the clothes. Compare the three public domain paintings in this post, all taken from Wikimedia Commons. From top to bottom, they are Henryk Rodakowski’s The Chicken War (1872, reflecting an event from 1537), Titian’s La Bella (1536, courtesy of the Yorck Project), and Konstantin Makovsky’s The Bride Show (1886, imagining Muscovy in the mid-seventeenth century). 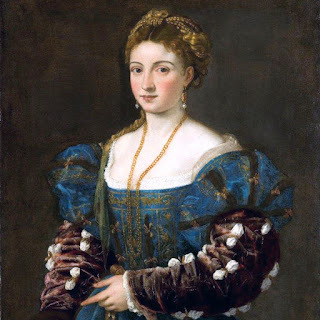 The women’s dress in Rodakowski’s and Titian’s paintings are the same style, very Italianate; the Makovsky depicts a different, equally beautiful but more oriental culture. Unfortunately, history hasn’t always been kind to that part of the world. The expanding Russian, Austro-Hungarian, and Prussian empires carved up the Polish-Lithuanian Commonwealth in the eighteenth century. The beautiful Renaissance palaces, already much reconstructed and “improved,” came tumbling down. The wars of the twentieth century obliterated what remained. Based on archeological excavations, the newly independent state of Lithuania has rebuilt the grand ducal palace in a sixteenth-century style, but we have to take it on faith that it bears any resemblance to the residence that the two Sigismunds and Bona Sforza knew. 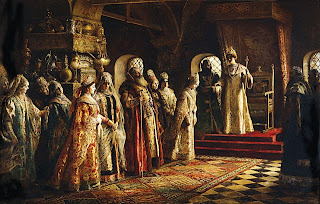 And though more than a few diplomats traveled through Vilnius and Krakow in the sixteenth century, they don’t seem to have left much of a record—perhaps because unlike Muscovy, which struck the envoys as exotic and foreign, Lithuania looked too much like home. So here I am, again trying to find out what my characters would see, touch, smell, hear, eat. What would amaze or appall them? Would they adopt the very different style of dress? Would they stick to their own customs with a stubbornness bordering on defensiveness? Which characters would adopt one approach and which the other? Whom would they meet, and what would they think of those people, especially the Italian queen accused more than once of poisoning her rivals?